Many of our products use Blush Vegetable-Tanned Leather, either as a detail on the handles or as a more significant portion of the bag. This is a naked, natural leather, with no synthetic finishing. It will not remain pristine; rather its beauty lies in the way it darkens and softens over time (as shown above), enriching its character and becoming unique to its owner. You will find that it wears in like a good pair of jeans. 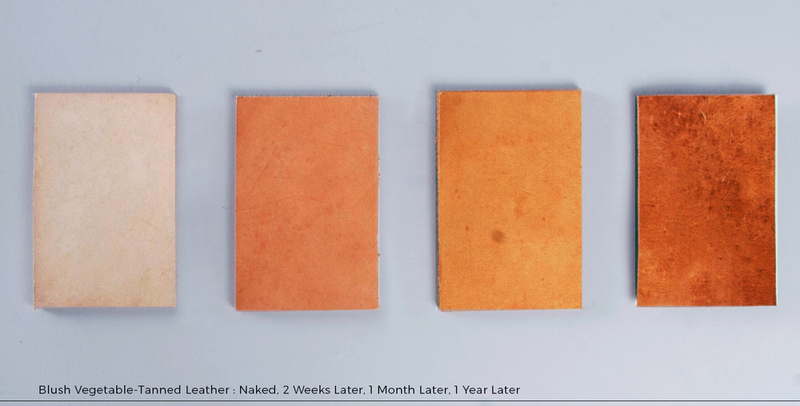 See below examples of how products with Blush Vegetable-Tanned Leather age over time. All of our canvases are 100% Cotton. We recommend the following methods of product care. Light dirt from everyday use - brush your canvas with a stiff brush to remove dust. Canvas discoloration - create a mild solution of warm water and detergent and use a washcloth to blot area (do not rub). Let it dry naturally. With any wet method, remember to cover surrounding leather to avoid water stains. *Note different care instructions for waxed canvas specified below. Tougher stains - consult your local dry cleaner. We do not pre-treat our canvases, as we know that each customer has individual preferences regarding Care + Wear. However, we have privately tested the product Vectra® 16 (available on Amazon.com), a non-toxic fabric protector. While no product can completely prevent soiling from occurring, we have found that this product is effective at warding off dirt and minor stains. If you choose to try this option, follow the instructions provided by Vectra® when applying it to your bag. Waxed canvas wears in like leather and will age beautifully. The fabric will show its texture with creases and folds that enhance the overall look of the bag. Waxed canvas cannot be dry-cleaned, machine-washed or washed with soap (as this will strip the wax from the canvas). However, the beauty of waxed canvas is that it can be used for several years without washing, as it naturally resists staining, dirt and liquids. In the event you do feel the need to clean the fabric, do so only with a damp cloth, without soap or detergent. Over time, you may want to re-wax your bag in order to maintain its water repellency. You can purchase a wax compound (we recommend Martexin Original Wax) and apply it by following the instructions provided by the wax product. All products that are made with Indigo-Dyed Canvas (including the Hand-Block Printed Indigo) should be hand washed in cold water with like colors. Hang dry. Our hand-blocked prints are made using natural indigo-dye and our indigo canvas is custom-dyed, and may release color for the first few washings. This fade brings out the grain of the fabric, creating a traditional “denim” look. The dye will stabilize, but until then, wash all indigo-dyed items separately in cold water. For questions regarding leather care, we recommend consulting your local leather goods repair shop. Note that Indigo-Dyed leather will darken with exposure to the sun and oil in your hands. This patina is part of the natural evolution of naturally-dyed leathers and should be embraced!